Mitla is the second most important archeological site in the state of Oaxaca in Mexico, and the most important of the Zapotec culture. 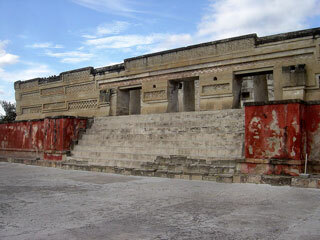 While Monte Albán was most important as the political center, Mitla was the main religious center. The name Mitla is derived from the Nahuatl name Mictlán, which was the place of the dead or underworld. This article uses material from the Wikipedia article "Mitla", which is released under the Creative Commons Attribution-Share-Alike 3.0 License.